Vancouver's Digital Strategy: Disruption, New Direction, or Business as Usual? A growing number of cities have started to realize the need to be ‘smart', to use digital technology to drive prosperity and capitalize on the rapidly growing digital economy. Some local governments have developed ‘urban digital strategies' to speed up the pace of change, and to move their digital planning from ad-hoc to an integrated and strategic approach. This paper examines Vancouver's Digital Strategy (VDS) and questions the role defined for this new piece of strategy. The findings represent competing views – offered by local government versus digital business community - for the role of digital in two areas of governance, and strategic planning. The paper concludes by suggesting that urban digital strategies need be incorporated into strategic urban and regional planning with a focus on the biggest issues, specific to each city. There is not a clear consensus in the literature on how to define strategic urban and regional planning. It is however understood that urban and regional planning is far broader that the classic definition of development control which refers to the planning process behind regulating and managing changes to land use and development. The broad definition of strategic urban and regional planning is clarified with reference to local contexts around the ongoing major issues facing cities and regions, whether climate change, social transformation, economic crisis, or technological advancement (Albrechts, 2006). An established body of the literature (Sartorioa, 2005; Searle and Bunker, 2010; Williams, 1999) discusses the never ending shift in the focus of strategic urban and regional planning as a result of the shift in what matters the most in different parts of the world at any points of the time. Infrastructure has been one of the founding pillars of strategic urban and regional planning (Burnham and Bennett, 1909; Saalman, 1971). Planners recognize that infrastructure, as a powerful driver of economic growth and social prosperity, exerts a profound and pervasive influence on cities and regions (Graham and Marvin, 2001; Neuman and Smith, 2010). The definition and scope of infrastructure, and as a result, the major planning concerns and policy issues associated with have evolved over time. More recently, the fast growing digital economy has highlighted the role of telecommunication infrastructure in strategic planning for economic growth and social development (Alizadeh et al., 2015; Neuman and Smith, 2010; World Bank, 2015). There is a new line of research about how cities and regions can/should capitalize on the potentials of telecommunication. 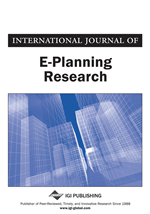 It builds upon the growing international research on smart cities and digital economy; and explores telecommunication-based opportunities in a range of planning topics including but not limited to participatory planning, public safety, disaster management, local and regional economic development, employment growth, sustainable development and control, transport management, governance, development assessment, and infrastructure (Heo et al., 2014; Rodríguez-Bolívar, 2015; Yau et al., 2014). The aim is to apply telecommunication to enhance cities’ liveability, workability and sustainability (Berst et al., 2014 p.6). Debates on the implications of telecommunication are not limited to academia. Different levels of governments around the world have started to develop policies and initiatives with the aim of capitalizing on digital economy (OECD, 2015; World Bank, 2015). National digital strategies now exist in a growing number of both developed and developing countries including: Singapore, India, Taiwan, China, South Korea, Malaysia, Ireland, Israel, Australia and Finland. Interestingly, the first generation of digital strategies focused on businesses (Bornheim, 2001; Kulatilaka and Venkatraman, 2001; Mithas and Lucas, 2010). The idea was that digital technology had reached the mainstream, so e-business or e-commerce was everyone’s business in the new economy (Fingar and Aronica, 2001). The digital business strategies were enforced by the concept of digital disruption (Christensen, 1997) which attracted an extraordinary level of attention from both academia and practice. It was argued that even though disruptive technologies (in this case digital technologies) initially underperform established ones in serving the mainstream market, they eventually displace the established technologies. Discussions on digital disruption put a great emphasis on the timing of adoption of new technologies and suggested that in the process of advancing disruptive technologies, entrant firms that supported the new technologies will ultimately displace the incumbent firms that supported the ‘old’ technology. The notion of disruptive technology in the business world has been re-examined and re-invented several times (Danneels, 2004; Downes, 2009; McQuivey, 2013). McQuivey (2013), for example, took the disruptive technology notion to the next level and called for businesses to find disruptive new things to do, rather than just doing the old things in new ways.